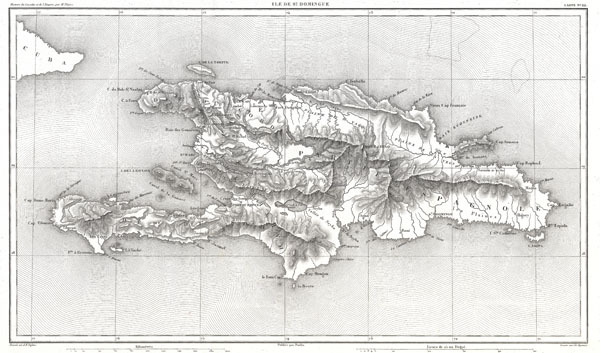 A beautifully engraved map of the West Indies island of Hispaniola or Santo Domingo by the French cartographer August Henri Dufour. Covers the entire island in striking topographical detail. Identifies towns, cities, rivers, lakes, mountains, and various undersea shoals and reefs. Names Mont Cibao, in the central part of the island, where Columbus famously failed to find rich gold mines. Today this island is divided between the Dominican Republic and Haiti. Drawn by A. H. Dufour and engraved by Charles Dyonnet for issue as map no. 22 in M. A. Thiers' History of the Consulate and the Empire of France Under Napoleon, 1859. Adolphe Hippolyte Dufour (1795 - 1865), also known as Auguste-Henri Dufour, was a Paris based map and atlas publisher active in the middle to late 19th century. Dufour claimed to be a student of another French cartographer, Emile Lapie. He is known to have worked with numerous other cartographers, publishers and engravers of the period including Charles Dyonnet and Duvotenay. His corpus includes numerous maps and atlases, the most striking of which is probably his monumental elephant folio Atlas Universel physique, historique et politique geographie ancienne et moderne. Dufour's student and successor was Alexandre Vuillemin. Charles Dyonnet (fl. c. 1822 - c. 1880) was an extremely active Paris based engraver working in the mid to late 19th century. From his offices at 220 Rue St. Jacques, Paris, Dyonnet engraved numerous maps for many of the most prominent 19th French cartographic publishers including Vuillemin, Dufour, Fremin and Duvotenay. From 1850-1861, he held the coveted position of "Graveur du Dépot de la Marine," and in this position engraved numerous French naval and military maps. Dyonnet had a detail oriented and aesthetically minded hand and is responsible from some of the most beautiful French maps to emerge during the 19th century. Thiers, M. A., History of the Consulate and the Empire of France Under Napoleon, 1859.